Spotted an exhaust spring on the floor; on investigation found 2 had broken, port outside front and starboard inside front. Changed them and had a good inspect but only just noticed a small line near the top of No 4 downpipe (rear port). On closer inspection, and removal of the small carb bowl shield I had wired onto the pipe, to my horror I saw the crack went 3/4 of the way round the back of the pipe up near the bend (I have seen other reports of this). I had wondered about the general discolouration of engine frame etc. around that side of the engine. It was just so hard to spot. I thought the engine had been sounding a little different and maybe it was a contributing factor to a couple of hicks i'd had recently. New item ordered from CKT and fitted (said 4 on the new flange but 1 on the old one). Graeme, I don’t know if the following is of any relevance to you but I had a history of identical cracking to yourself on my 912ULS. Both rear down pipes, twice each side. The photo attached shows the first time one went. Also numerous springs lost too. 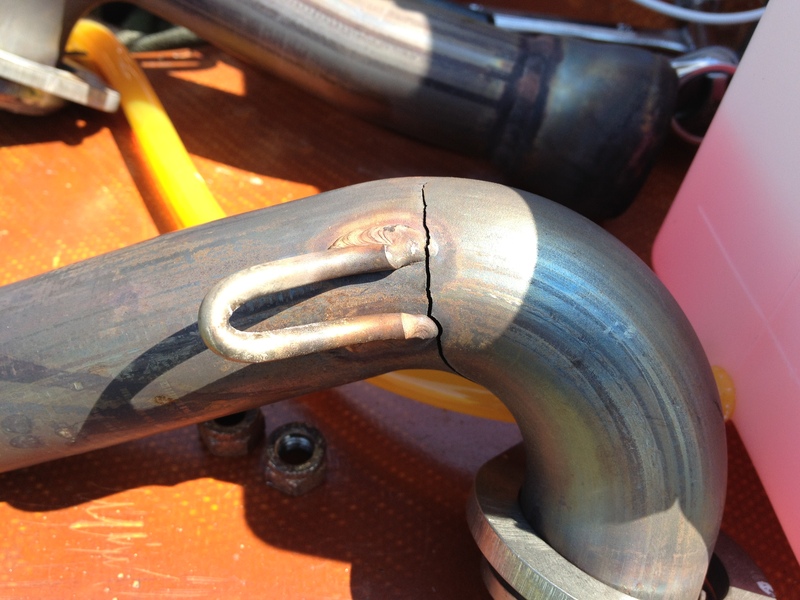 My engine was second hand to me, I had the first down pipe crack within 5 hours. Although the engine was generally very smooth running I had an ongoing problem with vibration immediately after starting (NOT kickback) and also when throttling back during descent after cruising flight (unloading the prop). This high frequency vibration was teeth chatteringly severe but only lasted a few seconds each time. I learned to live with it by modifying my starting technique and my initial descent technique but looking back now I fully believe it was this that was causing my exhaust to fail. On my description, Kevin Dilks immediately diagnosed it to be worn prop shaft splines. He said this was common on ex-weight shift microlight engines which mine was, due to their foot-throttles and very slow idling RPM habits. Kevin fitted a new prop shaft and the result was absolutely fantastic. All vibration problems completely gone for good and the engine is now like a sewing machine. Touch-wood my exhaust has stayed in one piece since and I’m very much hoping that issue has been cured too....! The new prop shaft was seriously expensive and I put it off for a while but it was actually the best single payment for maintenance that I’ve ever made on the machine. Interesting Jon, I think, from the discoloration, mine has been cracking over a period starting at the weld. I am now at 400 hours and had the engine from new. But I will keep my eye on it and watch for vibration. I cant say I have had any particular vibration at start up although there has been the odd start when the prop seems to stick and needs a reprime and re start.